One of Seth Troxler’s trio of fledgling labels, Play It Say It has already made its mark with stone cold killers from Sharam (Deep Dish) and most recently Clarian. Wasting no time with its next assault: Play003 comes courtesy of the UK dance pioneer Just Be (Matthew Bushwacka formally of Layo & Bushwacka). 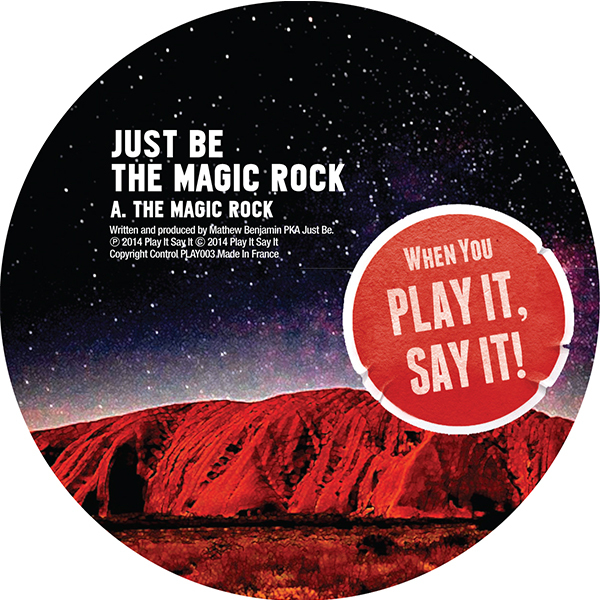 ‘The Magic Rock’ is exactly the sort of record to tease and satisfy in equal measure, as tension expertly builds with shakers, bleeps, bells and rave stabs into an all out tribally groove-led monster. B side ‘The Early Years’ is just as heavy duty in slower paced terrain as an intro of muted bass thumps gives way to another slow build up of layered percussion and a darkly penetrating vocal set in a simple yet powerful chugging framework. There’s no denying Matthew’s incredible and unwavering flair for an original groove. JUST BE has held many guises in his journey through electronic music. Launching his career as Matthew B in the midst of the UK acid house explosion, his identity and sound has undertaken many a metamorphosis, through Bushwacka!, The End Soundsystem, Layo and Bushwacka! to his present day incarnation as JUST BE. In total Just Be’s output under various guises has been phenomenal with six artist albums and a seventh due this year. The super producer has also delivered over 120 remixes, and 160 tracks for labels such as XL Recordings, End Recordings and his own labels Olmeto, Plank and Oblong. Since the emergence of JUST BE, Matthew has continued his attack on mediocrity with releases on Get Physical, Crosstown Rebels, Maison D'etre, and Intec Digital - all further cementing his place as a producer of the highest quality. With a solid background in pushing the boundaries of house, breakbeat, techno, downbeat and ambient, you can never be too sure what to expect with a Just Be record but you can be sure it will be a mood changer.